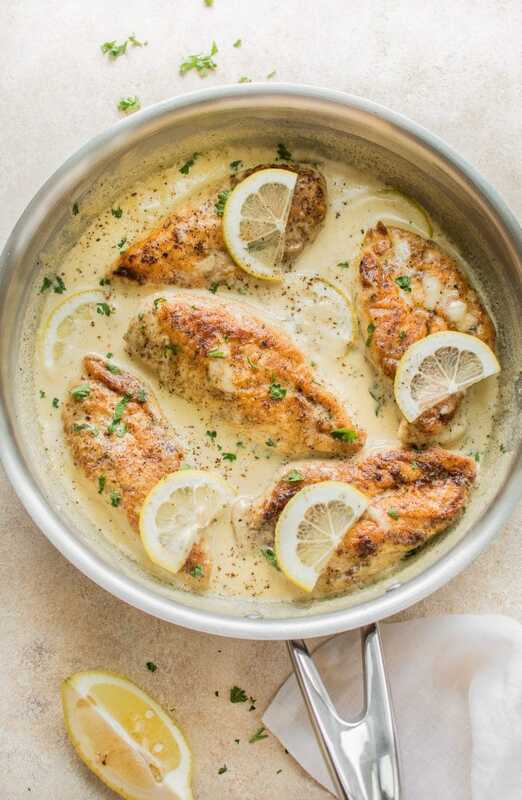 This creamy lemon chicken recipe is fast, simple, and uses everyday pantry ingredients. You will love the tangy lemon sauce. The chicken melts in your mouth! Easy and elegant! Ready in only 25 minutes. 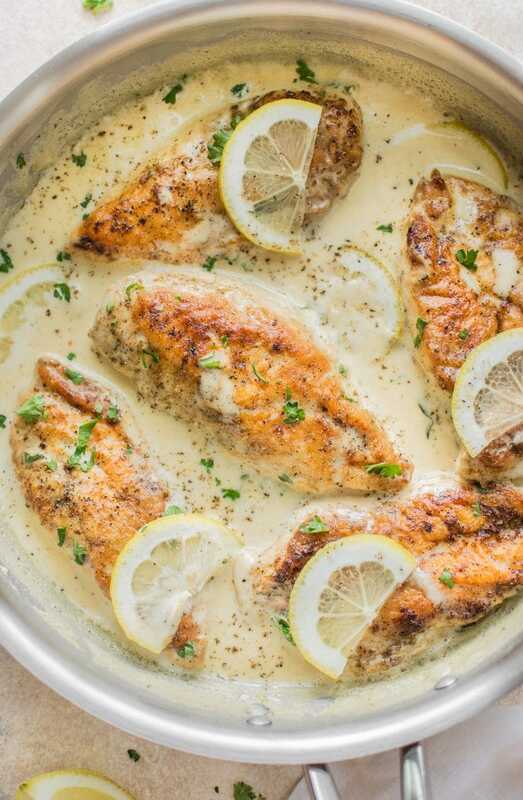 This creamy lemon garlic chicken is soo good. Chicken usually isn’t my favorite thing on the planet, but I really, really liked this dish. It’s really very simple to make, so this is something you could do for an easy weeknight dinner or even a slightly fancier occasion. Pretty sure that the creamy lemon sauce will be a hit. Cut your chicken breasts in half lengthwise and season them with salt & pepper and garlic powder. Dredge in flour. Cook them in the butter & olive oil until golden. Take them out of the pan and add the chicken broth and lemon juice; let it cook for a minute. Add the chicken back in the pan and pour the cream over top. Cook for another 5 minutes until the sauce reduces and the chicken is cooked through. I have a whole bunch of creamy chicken breast recipes on here, including but not limited to: my creamy garlic chicken, creamy Tuscan chicken, creamy mushroom chicken, Dijon rosemary chicken, and my creamy white wine chicken. If you want to leave the garlic powder out, you can, but it adds an extra layer of flavor to this dish that I just love. It’s definitely not overpowering at all. If you’re big into garlic, feel free to sprinkle on a bit extra. This chicken is fairly lemony, so if you want a more subtle lemon flavor, I recommend using less lemon juice. Feel free to substitute all or half of the chicken broth with dry white wine. Rice or mashed potatoes go very well. Vegetable-wise, green beans, asparagus, or sweet corn go fabulously with this dish. You could even serve it over pasta. 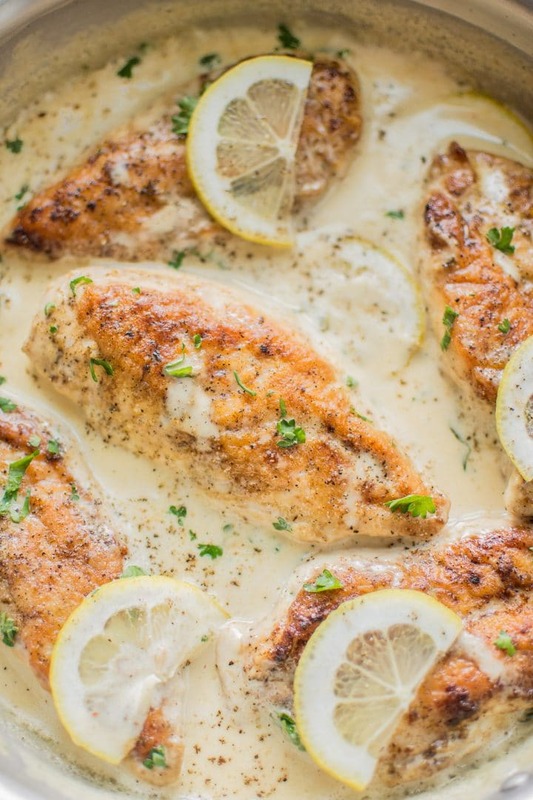 Like easy lemon chicken recipes? You may also like my chicken piccata, my lemon butter chicken, or my lemon chicken stuffed shells. I hope you will give these creamy pan-fried lemon chicken breasts a try! Questions? Talk to me in the comments below. 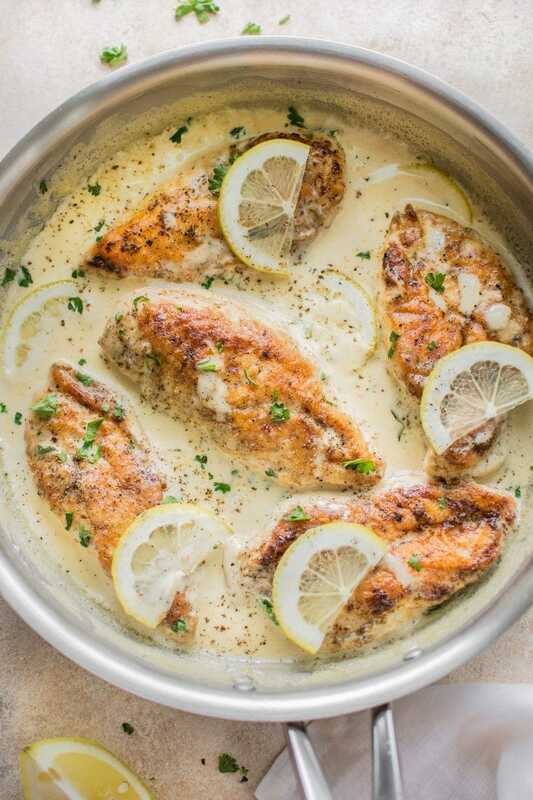 This creamy lemon chicken recipe is fast, simple, and uses everyday pantry ingredients. You will love the tangy lemon sauce. The chicken melts in your mouth! Easy and elegant! Slice your chicken breasts in half lengthwise to make thinner cutlets. Generously season them with salt & pepper on both sides, and sprinkle the garlic powder on both sides evenly. Dredge them in flour. In a large skillet over medium-high heat, melt the butter and olive oil. When the pan's hot, add the chicken and cook it for 4-5 minutes per side, until golden. Take the chicken out of the pan and set it aside. Add the chicken broth and lemon juice to the pan, and let it cook for about a minute (make sure to scrape up the brown bits at the bottom of the pan). Add the chicken back into the pan and pour the cream over top. Let the sauce simmer for 5 minutes or so, until the cream thickens up a bit and the chicken is cooked through completely. Before serving, I like to grate some lemon zest and stir it into the sauce, but this is totally optional. Add more salt & pepper if needed and sprinkle parsley over top if using. Serve immediately. You could swap the chicken broth with dry white wine if desired. I don't recommending swapping the cream for half-and-half or milk because the lemon juice may cause it to separate. This was delicious. More such easy receipies are needed. God bless you. Thank you for the delish recipe. Are you able to do this in the oven? I think you could definitely give it a try, Chantal. You may have to adjust cooking time – I’d use a meat thermometer to ensure the chicken is done properly the first time you make it. Would coconut cream work instead of whipping cream? Recipe sounds amazing but I am gluten and dairy free.